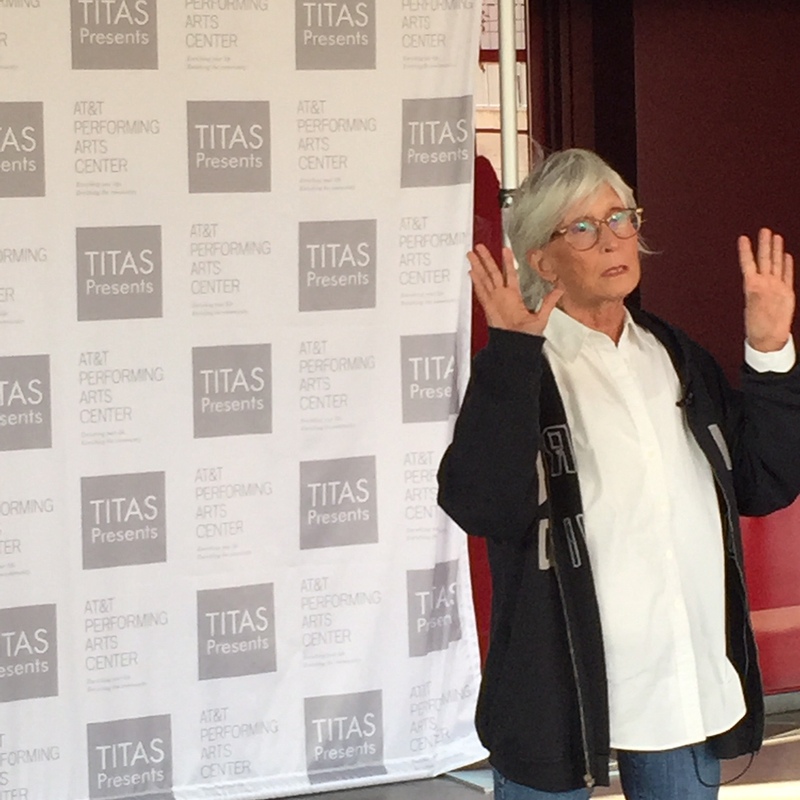 Guest blogger Danielle Georgiou sits in on a tech rehearsal as Twyla Tharp puts the finishing touches on her world premiere, presented by TITAS this weekend. Just call her the Doctor of Dance. Twyla Tharp, who holds nineteen honorary doctorates, started college as a pre-med major, but in her second semester changed the course of her life when she switched to dance—a change that we, both in the performing and non-performing world, are grateful for. Twyla Tharp at the Winspear Opera House, September 16, 2015. Photo: Danielle Georgiou. “I saw the long, long haul as a student trying to become a physician, and I said to myself, ‘Hold on here, I can learn more about the human body in other ways than sitting through these lectures.’ So, a lot of the work that I do, is in fact a kind of scientific examination,” Tharp said during a press conference on Wednesday afternoon at the Winspear Opera House as her company prepares for the opening performances of their 50th Anniversary Tour. It’s about as beautifully confusing as the human brain actually is. While the mathematics of it all can leave you bewildered, the entire piece is an exercise in how we think and how we remember what to do in our everyday lives. “How much can you retain physically? It’s an enormous amount of material and extremely difficult…how does the body memorize and learn…how do we make connections mentally, and how do we make connections physically? All having to do with how do we think? That’s really the question. And I thought I could probably address that question in what might be a more productive way as an artist, than as a physician,” said Tharp. This cross-training followed her throughout her career and became the basis of her creative method, particularly when working with classically trained ballet dancers and today’s more contemporary trained dancers. A practicality that has become a trademark for Tharp and has lead her to having one of the most successful careers in dance. Since graduating from Barnard College in 1963, she has choreographed more than 160 works: 129 dances, 12 television specials, six Hollywood movies, four full-length ballets, four Broadway shows, and two figure skating routines. She’s received one Tony Award, two Emmy Awards, the Vietnam Veterans of America President’s Award, the 2004 National Medal of the Arts, the 2008 Jerome Robbins Prize, and a 2008 Kennedy Center Honor. This year, she isn’t slowing down for a second, as this tour features two World Premieres, and continues her trend of producing dances that are creative, full of humor, and balanced with technical precision. Moreover, this tour will be the first time since 2002 that she has toured a group of dancers, and the first time she will premiere work in Dallas. “Dance is cosmic…dance is an art object…everything is creative…and there is a risk one takes in world premieres. The advantage: no one has seen it yet…and then there is the adventure of it all,” said Tharp. “Dance is valuable for everyone,” added Tharp, and while she will share her talents with us in Dallas this weekend, she has opened up her process for viewers far and wide with her recent New York Times blog series. Since August 18, she has contributed weekly essays giving readers a peek into her creative process and the development of the two dances of the tour, Preludes and Fugues and Yowzie. Preludes and Fugues is a tribute to four choreographers whose work Tharp has found inspirational. Set to four different pieces by Bach, each section is dedicated to a different choreographer—Merce Cunningham, Jerome Robbins, Martha Graham, and George Balanchine—and the diversity in choreographers and genres falls in line with Tharp’s personal and professional belief in cross-training. The company arrived in Dallas on Monday, September 14, and the show opens on Friday, September 18. I had the privilege of watching a technical rehearsal on Wednesday afternoon, during which the dancers worked through a section of Yowzie—see the video below. The energy in the theatre was infectious. The dancers were focused, wired, ready to dance; ready to perform. Tharp’s intricate use of space, time, and energy was immediately noticeable; inherently prominent in just the few minutes I watched. The space was filled with joy, a bit of slapstick comedy, and I could not resist the smile creeping onto my face. Tharp’s humor was on point. After this show, or any of her productions, Tharp believes that “the audience should walk away feeling better.” Dallas, the doctor is in. Time for your checkup. 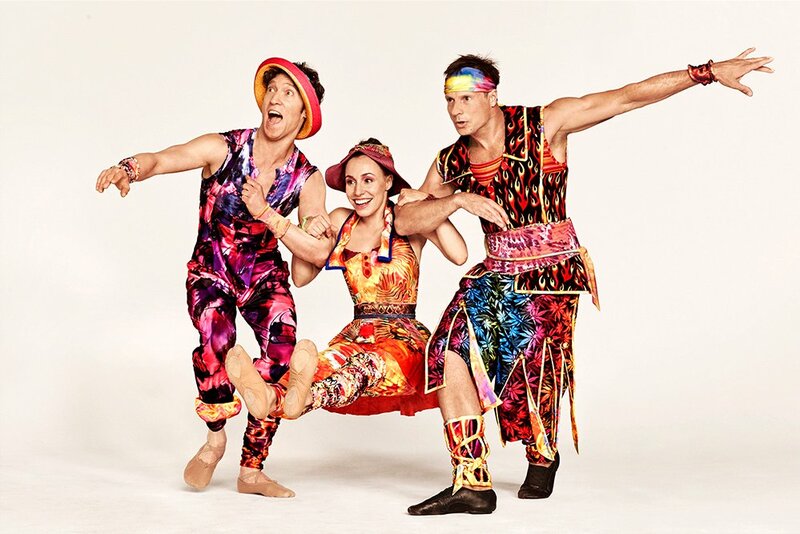 TITAS presents Twyla Tharp: 50th Anniversary Tour, Friday, September 18 and Saturday, September 19 at 8:00 p.m. at the Winspear Opera House.